Google's latest mobile operating system "Android 5.0 Lollipop" is currently officially available for Motorola Nexus 6 (a.k.a. Motorola Nexus X), LG Nexus 5, LG Nexus 4, Asus Nexus 7, Samsung Nexus 10 and HTC Nexus 9 smartphones and tablets, and soon other Android powered devices will get the Android Lollipop 5.0 Update. One of a famous Android developer named "Chainfire" has released his working CF-Auto-Root Script for Nexus 6 Rooting. So if you're looking for a Tutorial on How to Flash, Unlock, and Root Motorola Nexus 6 Smartphone Running Android 5.0 Lollipop Using CF-Auto-Root, then you're at right place! If your Motorola Nexus 6 bootloader is locked, then following guide will also Unlock Nexus 6 Bootloader. Following method will works on Windows, Mac OS X and Linux operating systems. We recommended to completely back up your Nexus 6. You will also lose your warranty. Follow at your own risk, as TechGlobeX won't be responsible for any damage! Download CF-Auto-Root .Zip File for Nexus 6 via Direct Link. You must have a USB Data Cable for plugging. You must be on Windows, Mac OS X, Linux powered PCs / Laptops. 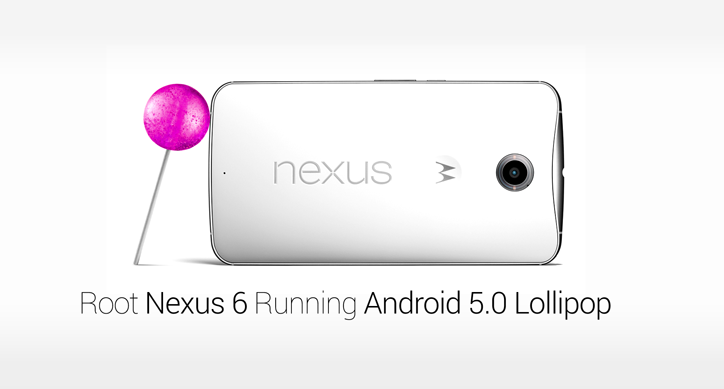 How to Root Nexus 6 Running Android Lollipop 5.0? Step 1: First, Download CF-Auto-Root Script and then extract all the contents to a folder on your desktop. Step 2: Now, Turn-Off your Nexus 6 device, and boot into bootloader mode via (holding Volume Down button and Power button together). Step 3: When you see the message saying "Restart bootloader" on the phone, let go of the keys and tap "Restart bootloader" to enter bootloader mode. Step 4: Now, Plug-in your Nexus 6 device to the Windows, Mac or Linux machine via USB Cable, and go to the location of your extracted contents (Step # 1). Step 5: You need to run the automated root script now. Simply run the "root-windows.bat" file. Step 6: If asked to unlock the bootloader, then go ahead and hit the Enter / Return key, even if you’re already unlocked. Step 7: Automated CF-Auto-Root Script will run and you should see it running on your Nexus 6, once the script done, Nexus 6 will be reboot. Congratulations!! You have just Rooted Nexus 6. Note: To confirm, if the script has rooted your Nexus 6 device or not, simply go to "App Drawer" and run an app called "SuperSU".